There are some lessons regarding health and nutrition that I have been slow to learn. One of them is how to properly hydrate myself. I used to be of the school of thought that if one ate plenty veggies, fruit, and whole foods, one could trust one’s thirst mechanism to indicate when it is time to drink. However, I discovered a couple of years ago that this is not necessarily true. I had been suffering from insomnia for several months and could not pinpoint the cause. Then one day, the word “dehydration” went through my mind. It seems that my intuition was trying to tell me that dehydration was the cause behind my inability to get a good night sleep. I upped my daily intake of water (I don’t remember by how much) and started to sleep like a baby within a day or two! This seemed to work well for me until I started taking a Hot Flow Yoga class and as is often the case with me, I learned another lesson in hydration the hard way. Most Americans are chronically dehydrated. In many of us, the thirst mechanism is so weak that it is often mistaken for hunger. Even MILD dehydration may slow down one’s metabolism. Lack of water may trigger daytime fatigue. Sufficient hydration each day may significantly ease back and joint pain for many sufferers. Even a small drop in body water can trigger fuzzy short-term memory, trouble with basic math and difficulty focusing on the computer screen or on a printed page. There are a few different guidelines floating around out there about how much water each of us should consume in a day. I like the advice a number of experts have given me. 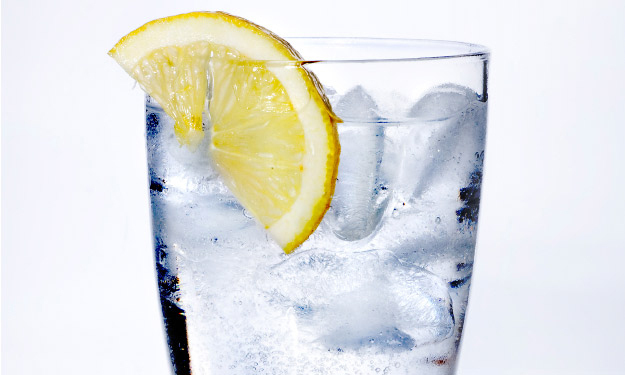 We should all drink 1/2 of our body weight in ounces of water every day. Therefore a 120 pound person should drink 60 ounces of water per day. I make this easy on myself by dividing the 60 ounces by 4. I drink 1/4 of the total as soon as I wake up in the morning, another 1/4 between breakfast and lunch and so on… I usually have the total done before 7:00 p.m.. This ensures that I won’t have to get up and pee during the night. My first attempt at trying to fix the dehydration problem was to drink iced green tea with lime juice, Real Salt, ginger and raw honey. (This is a variation of a drink that the Purification Support Team recommends while cleansing.) Green tea is hydrating and cleansing, the Real Salt has lots of minerals (minerals=electrolytes), ginger because I like it and gives the tea a nice zing, and the raw honey is a nice natural carbohydrate, full of enzymes and B vitamins that helps to keep my energy up. This drink helped with the “spacey” feeling I had and with my energy , however, it was not enough. Next, I tried plain coconut water. Coconut water is nature’s electrolyte gift to us! It has much more potassium than a banana and also contains sodium. The coconut water also helped, especially with the cramping in my back, but it still was not the answer. Finally, I asked my yoga teacher, Suzanne Dufresne if she knew of a good solution to my problem. I did not want to give up her class but I also would not drink any of the typical sports drinks that are on the market. (Read the labels – most sports drinks are full of chemicals and junk that do not belong in our bodies and please please please do not give these types of drinks to your children!) She said that most of the yogis she knew, used a product called Ultima Replenisher. I went home and immediately looked it up. It has the complete spectrum of electrolytes, other minerals, and B-vitamins. It does not contain sugar and it is sweetened with lo han guo and stevia! Well, OK! It’s clean! I was sold. I now have 22 oz. of coconut water mixed with 1 1/2 scoops of Ultima Replenisher before class and another 22 oz. ounces of the same drink immediately following class. I then go with plain water mixed with Ultima Replenisher for the rest of the day. On the days that I practice yoga at home or take walks, I go back to drinking 1/2 my body weight in ounces of water each day. Problem solved! I can now function normally on the days I go to class, I can work, I can play, and I no longer have any cramps in my back! I’m a happy girl and getting stronger and more flexible as the days go by thanks to my yoga practice. Now, there are many recipes on the internet for all natural electrolyte drinks and I have no problem with most of them. My friend Peg pointed out a great blog to me recently called Wellness Mama and as fate would have it, the author has published what looks to be like a couple of very good Sports Drink Recipes. I think they would be quite effective, but I like what I have finally hit upon and I think I will stick with it. It’s easy, it’s natural, and it gets the job done. If you end up trying these recipes or have something else that works for you, please share. Your healthy choice might just become another person’s healthy choice! I am passionate about helping others reclaim the health and vitality that we are all entitled to. I will share with you the choices I make that contribute to my good health and the health of my family. I think one of the biggest problems (as you pointed out) is that most people don’t realize how dehydrated they are. 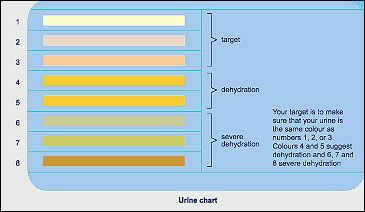 One indication of dehydration that I learned many years ago, when I was much more active in sports was the color of your urine. While other things can affect the color, it seems as a general rule of thumb, that the darker your pee is, the more dehydrated you are. Thanks Shahin! Those are all very good facts to include here!